weber_cam: Perforated Al° SHEET, nice run. Perforated Al° SHEET, nice run. 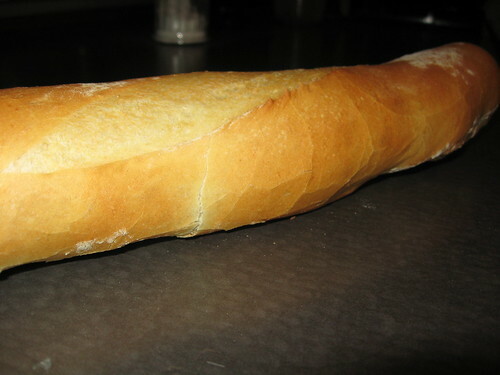 In my previous post, I discussed my new perforated aluminum sheet as an attempt to get my baguette closer to an authentic baguette's specifications. Here's my first attempt. 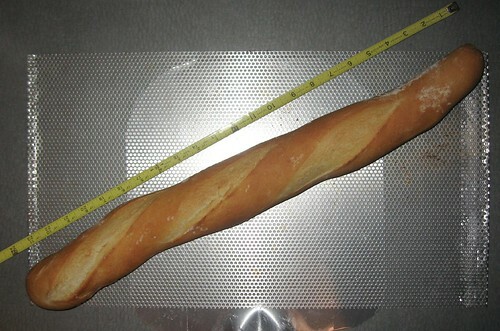 Using the diagonal of the sheet, I was able to get 24" and 400 g (a real baguette is minimum 30" and 250 grams, so it's way off, but closer). It looks nice despite the vents on top not being quite right. Check along the crust too, the characteristic crackled mosaic-like crust is spot on. Lots of surface exposed on this. Looking forward to breakfast. 1. The baguette pan need not be in the scooped shape, the flat sheet still makes the loaf pop (oven spring) when it hits the oven. I always suspected this was because of the steam getting through the perforations in the sheet. I'm more convinced this is the reason now. 2. I look forward to making a killer sheet pizza using this. No shoving the thing on and off a peel. 3. The sheet stores better than any pan I have. Thanks Andrew, On second thought, I may use it for pizza, but I doubt on the bare surface. With pizza, I often let the crusts, rolled out and pre-baked, sit for up to an hour before baking. This makes for incredible bubbles on the surface. But, this also allows it to stick to surfaces (except parchment). So, I may use the sheet, but only as a substrate that heats up quickly - but still use a sheet of parchment between the pizza and aluminum.